"...I have a little Mac program called Savvy Clipboard, which lets you have a large number of clipboards with text saved, then move to the clipboard you want and enter from it. I set up my Calendar ... and used Savvy Clipboard to enter the text of an event once I'd moved to the day I needed. It really didn't take too long to enter my repeating events for the semester. " "...This handy app is very easy to use, and it's so helpful in my everyday work! Now I can't even imagine doing without it. I guess it's the best clipboard manager I've seen. Many thanks for the good piece of software! :) "
Savvy Clipboard adds a multiple Clipboard capability by storing a list of items you copied to the Clipboard. 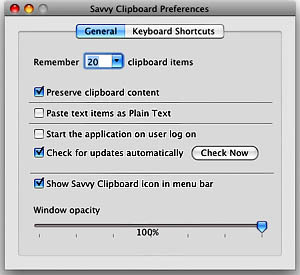 This version of Savvy Clipboard may be helpful for you if you prefer to stick to PowerPC or use Mac OS X 10.3.9 — 10.6. Yet, it is compatible with the newer OS X editions up to Mavericks (10.8). This version contains fixes for working with images and screenshots. Starting from Version 2.8.1, the program adds compatibility with some popular typing productivity tools (Typinator, Text Expander and PopChar X), letting you work comfortably with these typing utilities. Many other improvements were added. You can download a shareware version for FREE to try it out for yourself, and you are welcome to get the full version (offering many helpful features without limitations) for just $14.99. Do you often copy things and paste them to other locations? Would you like to retain what you copied before, and be able to use those items again, or save them to disk? Savvy Clipboard will remember what you copied, and store those data items for you. It holds a list of items that you copied — text fragments, graphics, URLs, multimedia data, or links to files — and lets you access them using this list. You just select the needed item from the list, and it is ready to use from the system Clipboard, so you can paste it anywhere you want. 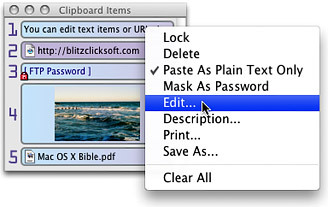 You can also edit clipboard text, send emails and store your passwords in a handy way. To save your screen space, you can hide Savvy Clipboard's window and use it from the menu bar or as a Popup Menu. And by labeling your clipboard items with brief text descriptions, you will get the needed item quickly and easily. If you want to use some items frequently, you can "lock" them in the topmost positions in the list, and use handy shortcuts to access them. The wide export (and printing) capabilities add convenience to using Savvy Clipboard for various purposes. And moreover, it's now easy to backup the entire list of your clippings, or even move it to another computer as needed! With Savvy Clipboard, you speed up your work (no need to look for the same data over and over again), and gain a new level of control over things you work with. Savvy Clipboard can store clipboard data items of various types, and let you access them later. You can save a data item to a file (through the menu or just by drag-and-drop! ), create web/email shortcuts, and print your clippings. In the registered copy of the application, you can store as many clippings as you need. All these items will also be available from the menu bar and the Popup Menu, saving your screen space. You can Export/Import the whole list to backup it at any time and reuse it later. This function also helps you transfer the list to another computer where you have a copy of Savvy Clipboard, thus saving your time and optimizing your working environment. You can label the items with brief text descriptions. You can edit your text items and URLs for further use (in the registered copy of the program), and choose to paste text with formatting or as plain text only. You can drag and drop data items from Savvy Clipboard to other applications (without having to copy them to the system Clipboard). Savvy Clipboard can preserve clipboard content between sessions — i.e., if you shut down the system and then turn on the computer again, the data will remain available. You can use Savvy Clipboard to store your passwords (masked by bullets or descriptions) and keep them in fixed positions in the list. You can define custom keyboard shortcuts to select items from Savvy Clipboard (the data item will be copied onto the system Clipboard, and you can paste it as you need). Savvy Clipboard is a Universal Binary program, i.e. it runs natively on both PowerPC and Intel-based Mac's.